Anna Ivey wrote the book... literally! 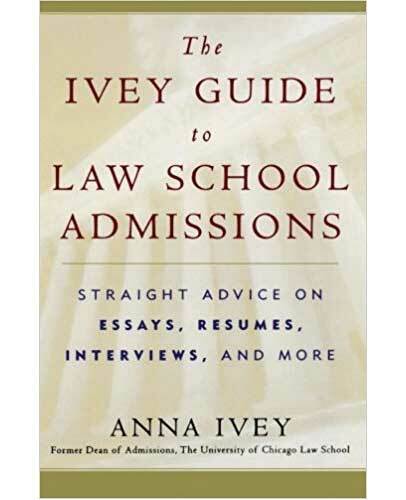 Pick her brain in The Ivey Guide to Law School Admissions, the first book of its kind written by a former dean of admissions from a top law school, and the gold standard in the genre. Drawing on first-hand admissions experience, The Ivey Guide offers inside tips and dos and don'ts on everything from effective essays, interviewing techniques, résumés, and recommendations, to admissions officers' pet peeves and more. Stay in touch through our book page on Facebook. Available at Amazon.com as an e-book. The print edition is available on Amazon.com. However, the electronic edition is more current and that is the one we recommend. We are former admissions officers and experts at coaching applicants through all phases of the application process. We can help you every step of the way, and our packages are designed to give you maximum flexibility. You can sign up for a little bit of help or a lot, with every phase of the process or just one or two. You choose. Explore our law school services and connect with us.